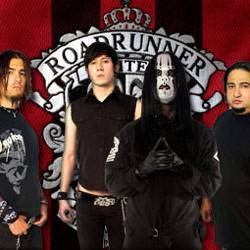 Here are some collection of 'real' song played during the Roadrunner United: The Concert. It's really rare to find the mp3 for the concert, so decide to search the garbage and compile it all together, in any case where you watch the video but didn't get any point of what the hell they were jamming in that particular time. Nuff said, enjoy it! 2. MADBALL's "Set It Off"
3. STORMTROOPERS OF DEATH's "March Of The S.O.D." 4. LIFE OF AGONY's "River Runs Red"
5. OBITUARY's "The End Complete"
6. MERCYFUL FATE's "Curse of the Pharaohs"
9. DEICIDE's "Dead By Dawn"
10. TRIVIUM's "Pull Harder On The Strings Of Your Martyr"
11. KILLSWITCH ENGAGE's "My Last Serenade"
12. TYPE O NEGATIVE's "Black No. 1"
15. ROADRUNNER UNITED's "Tired And Lonely"
17. ROADRUNNER UNITED's "The Rich Man"
18. ROADRUNNER UNITED's "The Dagger"
19. ROADRUNNER UNITED's "The End"
20. SOULFLY's "Eye For An Eye"
25. SEPULTURA's "Roots Bloody Roots"